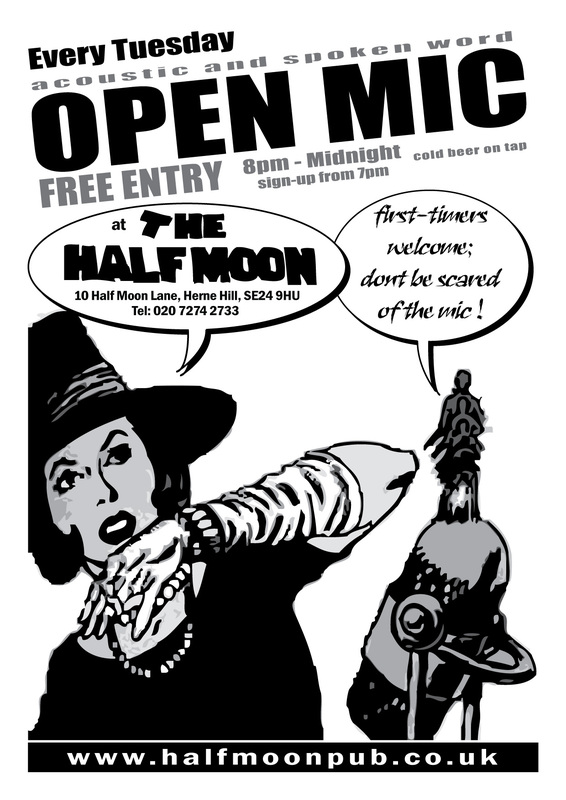 its the NeedleandThread open mic..
doors 8pm - midnight, sign-up from 7pm..
get down here and grab a drink, for an eclectic evening of musical and spoken performances, from some of south londons finest.. we have a large stage, a fat sound system, a professional sound engineer, and a nice chilled, responsive atmosphere..
doors 8pm - midnight, sign-up from 7pm.. get down early with your instruments / words to sign up to perform, as it can get quite busy.. or, of course, just come down, relax, and enjoy some great music, from a random, lively, and eclectic bunch of londons musical massive.. The pub has a long tradition of live music. The list of names to have graced the stage over the past 25 years is very impressive, The Police, Van Morrison and U2 have all played the half moon in their younger days.. have you? gonna start recording stuff, and popping some of the recordings on here.. again, let us know what you think, paste up a comment or two..